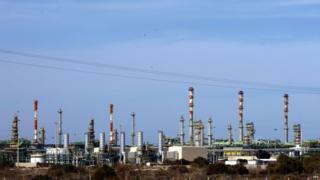 Four Italian construction workers have been kidnapped in Libya, the Italian foreign ministry has said. They were abducted near a compound owned by Italian oil and gas group Eni in the western Mellitah area, the ministry said. Italy closed its embassy in Libya in February, calling on Italians to leave because of the dangers to foreigners. The country is beset with warring factions four years after the civil war that ousted leader Muammar Gaddafi. The foreign minister Paolo Gentiloni told Italian media on the sidelines of a meeting of EU foreign ministers that it was difficult to speculate about who was responsible for the abduction at this stage. The workers are employed by Bonatti, a company that provides services to the oil, gas and energy sector, a spokesman confirmed. They were kidnapped while returning from Tunisia on Sunday evening, La Repubblica newspaper reports. Two rival governments are vying for legitimacy and territory in Libya and so-called Islamic State (IS) is among the armed groups operating in the country. Nine foreign oil workers were kidnapped by IS in March.